Wynne Jenkins is a native of Llangennech, Llanelli. He was educated at Llanelli Boy's Grammar School, and graduated from University of Wales, Swansea. Carmarthen has been his home town for over 30 years. 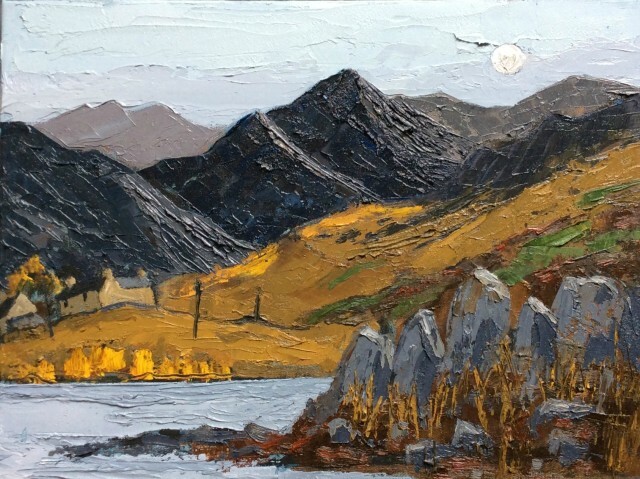 Through his painting he has the opportunity to transform "everyday" scenes into an art form - the timelessness of Wales' seascapes and mountains artistically unfold. The palette knife, rather the brush ensures a precision of relevent detail brought to the eye of the observer. His subjects are unmistakably Welsh, and his bold and broad palette gives his work great vivacity and verve. His buildings, often cinched and leaning seem to dance and throb with the energy of the lives and history within. There is no melancholy here, no sense of a community in decline or retreat. Rather, we have a vision of a place full of light, energy and love. He makes our familiar and shared landscape, exotic and a little thrilling! Wynne Jenkins has had successful exhibitions with us in 2014, 2015 and again in 2017. He will return with a new body of work in June 2019.